What happens during a credit check? If you’re shopping around for credit cards, once you submit your application the lender is going to run a credit check on you. This means that they’ll be looking at both your credit report and your credit score. Your score will fall anywhere between 300 and 850 and is obtained from the information on your credit report (payment history, amounts owed, length of credit history, new credit, and types of credit used). When a credit check is run on you, it’s called a credit inquiry. Will a credit inquiry hurt my credit score? Yes, but only slightly. It hurts your credit score because it means you’re looking for a new line of credit, and are thus in need of it. It varies from person to person, but for the average consumer one additional credit inquiry will only drop his or her credit score by five points; however, it will be more if your credit history is shorter or if you don’t have that many lines of credit. Research has shown that when a person has a lot of credit inquiries within a short period of time, that person is significantly more likely to declare bankruptcy in the not so distant future. What if I’m shopping around for loans? If you’re looking for the best car loan, student loan or mortgage, FICO will treat all related inquiries as a single inquiry. Why? It’s obvious you’re price comparing — meaning you’re being smart, not desperate. So if you’re rate shopping, you typically have 30 days to price compare. 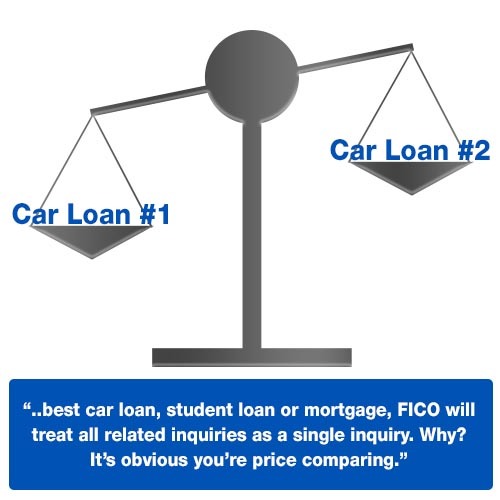 If you don’t decide upon a loan in that time frame, it’s still worth it to continue price comparing. Ten points off your credit score is a small risk to take if you’re saving money. Does the same rule apply when applying for credit cards? No, that’s different. Credit cards are considered revolving credit, and are different from a loan. Applying to multiple credit card lenders WILL hurt your credit score. A hard credit check is when a financial institution is looking at your credit score/ report and using the information they get to decide whether or not they’re going to issue you a line of credit or offer you a loan. A soft inquiry is performed either by you, an employer, or possibly a credit card company considering you for pre-approval. These do not hurt your credit score. Hard credit inquiries happen only with your permission, whereas a soft inquiry can happen without it.